• Sonsie (327 Newbury Street, Boston): Newbury Street is Boston’s version of Rodeo Drive, and there’s no better place to be seen in this see-and-be-seen boulevard than at one of the front tables at Sonsie. The bistro tables front the restaurant’s sliding front windows. If you’re lucky to snag one, it’s the perfect perch to nibble on an appetizer, sip a cocktail, and watch passersby shop ‘til they drop. • Loco Taqueria & Oyster Bar (412 West Broadway, Boston): Mexican fare blends with Boston’s penchant for seafood at this indoor/outdoor restaurant in the heart of trendy South Boston. Tables closer to the front of Loco are as close as you’ll get to patio dining (we need to clear a few more snowstorms before that opens) this time of year, as picture windows open up to let in a fresh breeze while you imbibe on tequila and guacamole. • Castle Island (2010 William J Day Blvd., Boston): The warm weather means Boston’s countless runners are all lacing up to enjoy a great day for cardio. Castle Island in Southie offers picturesque views of the downtown skyline as well as Boston Harbor. 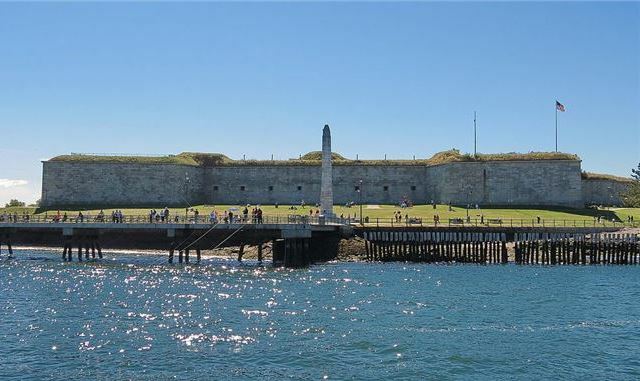 Take in Fort Independence, one of the oldest fortified sites in North America, and be sure to finish your loop around the bay with a pit stop at Local 149, a great spot for food on nearby P Street. • Assembly Row (355 Artisan Way, Somerville): Hop on the Orange Line and head to Assembly. This rapidly growing mixed-use mecca is perfect for dining, shopping, and even catching the latest Hollywood blockbuster. Grab an ice cream at J.P. Licks (a local favorite) and stroll the tree-lined streets, or grab dinner at River Bar and take in the Mystic River waterfront.